I never liked Captchas because the burden was always on end user to understand the letters and prove that he is a human and not a software bot. But when I recently saw new Google reCAPTCHA on a website, I instantly liked it. Because all we need is to check a box and it will figure out if you are a human or robot. Google is calling it No CAPTCHA reCAPTCHA experience and it uses an advanced risk analysis engine and adaptive CAPTCHAs to keep automated software from engaging in abusive activities on your site. So that formed the basis of this post where I will show you how to utilize Google reCAPTCHA in your java based web application. Before we move on with our project, first thing you need to do is go to Google reCAPTCHA and sign up. After that you will get a Site key that is used to display the reCaptcha widget on your web pages. You will also get a Secret key that should be kept secret and used in communicating with Google server to verify the captcha response. After I registered a test site, I got below keys and I will utilize them in my project. Note that while signup you also need to provide domain name and the keys will work only on that domain name. Also keys will always work on localhost, so I can easily test it on my local server. Now we can head over to our example project. We will have a login page where user will enter username and password, apart from that he will also have to solve reCaptcha and submit the form. Once the form is submitted, username and password will be validated in our application, whereas we will send the captcha response with secret key to Google reCaptcha server and get the response. The response from Google reCaptcha is a JSON with a success boolean field, if validated success value will be true otherwise it will be false. 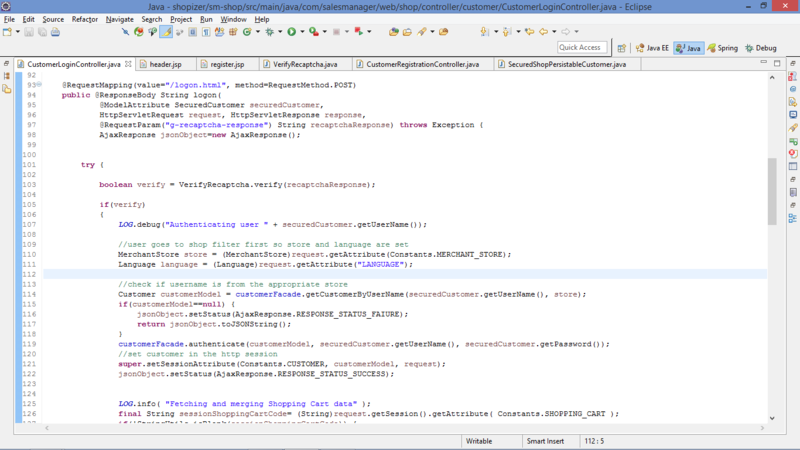 I will use Java JSON Processing API to parse the response JSON. Below image shows our final project in Eclipse. To get the project skeleton, just create a “Dynamic Web Project” in Eclipse and then convert it to Maven project. Just add below dependency in pom.xml file for JSON API. Let’s look into each of the components one by one. Below is our login html page code. We need to add Google reCaptcha JS file in the HTML head section and then add <div class="g-recaptcha" data-sitekey="Site-key"></div> in our form to get the reCaptcha widget. That’s all at the client side, it’s really this simple! Once user is validated he will be sent to below success page. 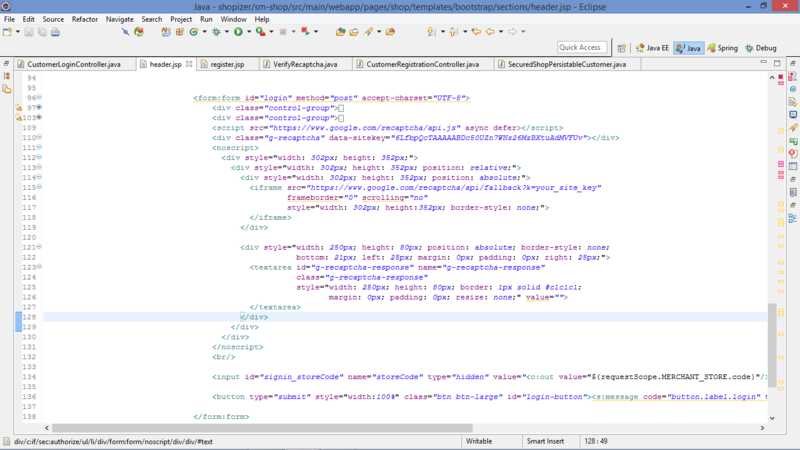 Below is our simple LoginServlet.java servlet code where we are validating username and password fields. For simplicity, they are embedded as WebInitParam in the servlet code itself. Note that you need to use Servlet 3 to use these annotations, so you need to use Tomcat-7 or later versions that support servlet spec 3. Once form with captcha is submitted, we get “g-recaptcha-response” request parameter that is required to send for verification. The last part is the utility class to send POST request for verification and parse the JSON response and return accordingly. String postParams = "secret=" + secret + "&response="
That’s all. Our application is ready, below are the response pages we get based on user inputs. You can download the project from below link and play around with it to learn more. I ma receiving below exception at localhost. i got an error : Localhost is not in the list of supported domains for this site key. Do you have steps how to make it work when application is hidden behind proxy. Do you know how to integrate reCaptcha with Spring security? Works perfectly well on localhost. Haven’t tested on live server, but I haven’t had such a need, just needed to quickly test the recaptcha. For a live scenario I’d use a different JSON and HTTP client libraries. Tried of searching many tutos but found this is very useful, while implementing your exercise I’m getting this error: ” ERROR for site owner: Invalid site key “. I have given proper site and secret key, googled it with google suggestion recreated my site keys but on my local site I’m not getting can you please help in this regard. very nice i tried to implement is and its working good thank you!! You help us. Thank you so much. This tutorial is perfect man. Do you have any mock test for reCaptcha? recaptcha requires google certificate on application server, and validity on certificate is is just couple of months, how to maintain ever changing certificate on production servers. Really nice article, I found it quite helpful while integrating Google captcha in my application. Great sample page, right-to-the-pont explanation what to do, truly working examples and helpful code snippets. You just saved me a few hours of time. Thank you! If I open URL from browser along with secretkey and response value, JSON object returning true. When I try to use your example I am getting connection timeout errors. I have registered localhost and got the sitekey and secret key. and it all works fine when I directly hit the verify URL in the browser. JSON obj is returning true, but its not wokring in the code. I am getting the same issue. Did you find out the solution ? It’s possible to make a unit test with Mockito framework ? If not, what Is the Best Way to test the recaptcha. Should it be straight forward like in jsp? Thank you, Pankaj, this demo helps me a lot! This tip helped me too much, I was giving up already to make recaptcha, then I saw here I have to do the server-side validation, not the angularJS. Thank You !!! Congrats on this post, very helpfull! As per above post, we do the captcha verification from servlet code. 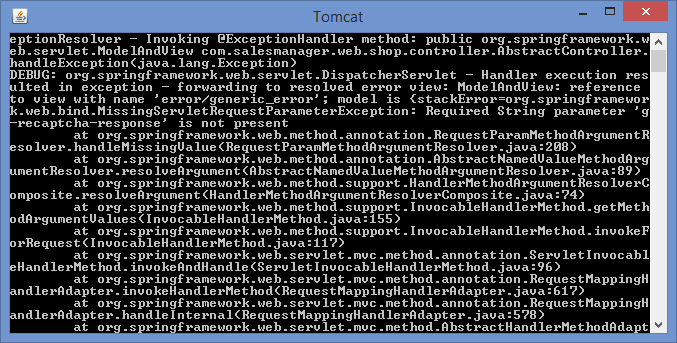 Servlet code mostly deployed in application server in production site. It is not practice to allow internet access from production application server. Since we have to hit google url “https://www.google.com/recaptcha/api/siteverify”, what is the alternative to verify the “g-recaptcha-response” before reach to servlet(server), that is get the verification done at browser code itself. It is working fine when I integrate this in our web application. But how can I remove Privacy Terms in the widget, because our business doesn’t want to display google terms and conditions on our web application. I don’t think there is a way to remove it, since you are using Google service you will have to respect their privacy terms. I get error: “Require String parameter ‘g-recaptcha-response’ is not present”. I’m a newbie, please help me. This recaptcha is working in with localhost tomcat.How when I put on live server in a Linux machine does not work. Could I plz help. I am really struggling. What is not working, are you not getting the widget in UI, or you are not getting the response tag to server in the form or you are not able to validate it by submitting request to server. If you are putting on a live server with domain name, make sure your keys are registered with that domain name. I am using above example for our website. It is working in local host but it is not working in linux live server. I am getting connection timed out error. Could I plz help. I am really struggling.